The Andrew W. Mellon Foundation has awarded the Buffalo State College Foundation with a $328,200 grant to enhance the Art Conservation Department’s library and archive conservation program. It will be combined with a similar grant awarded last December to enable the college to engage and retain more students in this unique specialty by providing competitive stipends. The additional funding also will allow Buffalo State to bring in rare book and paper conservators specialists, such as MacArthur fellow Timothy Barrett, the director of the University of Iowa Center for the Book, who visited the college in October. Only one of four programs like it in the country, Buffalo State’s 41-year-old graduate level Art Conservation Department accepts only 10 students a year into its competitive three-year program, which trains conservators of fine arts and material cultural heritage. 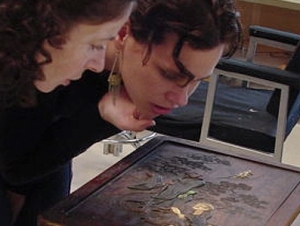 This includes the training of rare book conservators and flat paper specialists who focus on library and archive materials, along with conservators trained in fine art on paper and photograph conservation. Buffalo State graduates are noted for their familiarity with contemporary practices and valued in the workplace for their ability to devise and perform standard and advanced treatment of rare books, photographs, circulating collections, maps, archival materials, and manuscripts. Buffalo State graduates can be found in the conservation labs of major institutions across the United States, including the National Gallery of Art, the Library of Congress, and the Smithsonian Institution in Washington, D.C.; and the Brooklyn Museum, the Metropolitan Museum of Art, and the Museum of Modern Art in New York.